There are baby animals, minibeasts, flowers and more in our collection of complete the picture puzzles for spring. A fun way to test children's observation and drawing skills on a showery spring day. Here's a lovely spring puzzle. Can you complete the missing sections of the pretty spring blossom? This complete the picture, with a cute picture of a bee to copy, is perfect for younger children. Perhaps follow it up with some honey on toast! Complete the cute caterpillar picture, a test of drawing and observation. Children must use their observation skills to help them complete the missing parts of the daisy on this fun puzzle. A puzzle, a drawing activity and a cute duck in one, our complete the duck puzzle has lots of kid appeal. Can the kids finish the top picture of our silly frog by copying the missing parts with reference to the bottom picture? The ladybird is missing her spots! Use the picture below to help finish drawing the ladybird. Look carefully to place the spots. The simple shape on this rainbow makes it a perfect introduction to our complete the picture puzzles for young children. Can you follow the bold lines to draw in the face and legs and complete the sheep puzzle. Practise drawing skills by completing the snail picture, using the picture below the grid as a guide. This "complete the snowdrops" puzzle is one of our trickier ones. Look closely at the leaves and flowers on the bottom picture and follow the lines to complete the picture. There are lots of details to include in this challenging "complete the spring tree" picture puzzle. Look very closely and take your time! 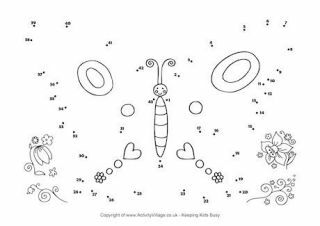 This combined puzzle and drawing activity asks children to use their observational skills to complete the stem and petals of the tulip. Make sure you are not caught out by a spring shower by completing the umbrella on our puzzle! When you have drawn the picture get out the crayons and colour it in.